I thought this was a good quote as we celebrate our freedom on July 4th, and we certainly have been experiencing a lot of sunshine! The flowers in the field are enjoying the heat and sunshine. It is so wonderful to walk out into the field and be greeted with splashes of color where it was just green a few weeks ago. One flower in particular has been a real worker for me…….yarrow. This lovely perennial continues to produce beautiful, airy blossoms and it releases a delicate herbal perfume. 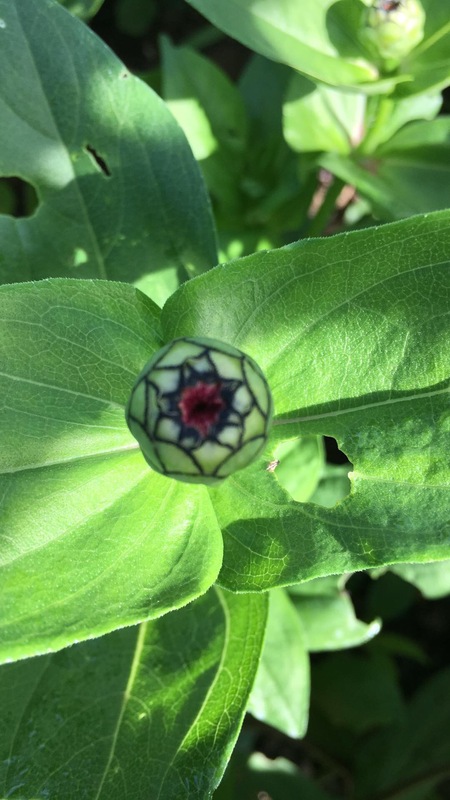 The plant is also an amazing medicinal herb with great healing properties. As you know from previous letters, in the Language of Flowers yarrow represents Healing and Everlasting Love. According to folklore, if one places yarrow under your pillow and recites the following poem, you will have a vision of your future partner! Following are the meanings for this week’s flowers. Once again, your bouquet will contain some but not all of the flowers in the list. To extend the vase life of your flowers, change the water every day or two and trim the stems by ¼” every 2 to three days. Enjoy the sunshine, your freedom and your flowers! The fields are filling with color………. Summertime! I think it is finally here. We have been blessed with some beautiful days and the palette at the farm is becoming more diverse. 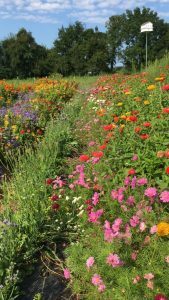 The snapdragons and cosmos are coloring the fields with beautiful pastels, and the sunflowers are starting to show their beaming faces. Slowly, but steadily the flower farm “painting” is being created. The bouquets this week will contain cut flowers as well as some wildflowers. Once again, no two bouquets will be the same. Your bouquet will contain a combination of some, but not all of the flowers listed below. Your bouquet will be labeled with your name. Hopefully this will alleviate some confusion that has occurred at a few sites. Please be sure to check for your name on the paper sleeve, and remember to check off your name in the notebook near the bouquets. For those of you who pick up your flowers at TMC Wellness through Movement, if your bouquets are not on the porch, they will be inside the building. Well, Week One did not go as smoothly as I hoped it would. I did not anticipate a backup of traffic on Interstate 83. My sincere apologies to any of you who had to wait for your flowers. This week I plan to leave the farm much earlier. I hope you enjoyed your bouquets. Mother Nature continues to challenge my flowers and me! We had a few nice sunny days, but tonight I look at my weather app and see that the temperature will drop to 58 degrees tonight. Ahhhhh, the wonders of Nature! This week’s bouquet is similar to last week’s bouquet with a few added feature flowers. The flowers in this week’s bouquet represent healing, affection, lust, purification, introspection, presumption, joy in love or life, flight of fancy and virtue. All the bouquets will have the same base, but there will be different feature flowers in the mix. Once again this week, my focus has been on introspection as represented by the beautiful perennial flower, Penstemon. It can be challenging for a recovering perfectionist to be in a “Nature-Driven” occupation, but I am learning my lessons. I strive to focus on peacefulness, healing and the joy of love and life that resides in all of us. Nature is my healer and my teacher. Mother Nature certainly is challenging my flowers and me! Today as I walked through my beds, I watched my flowers shivering in the wind. I saw my raised-bed walkways flooded with a foot of water. Welcome to the CSA Buy Local Flowers Experience! This week’s bouquet is about innocence, healing, affection, lust, purification and introspection. As I think about my own thoughts today in the fields, I feel that I experienced all of those emotions. The innocence of nature as she adapts to what is, the deep affection I feel for the earth and my beautiful flowers and the healing energy I always feel while in the fields, the lust for sunshine (! ), the purification of nature’s cleansing systems, and my own introspection on how we really are not in control. Let it be and it will be! 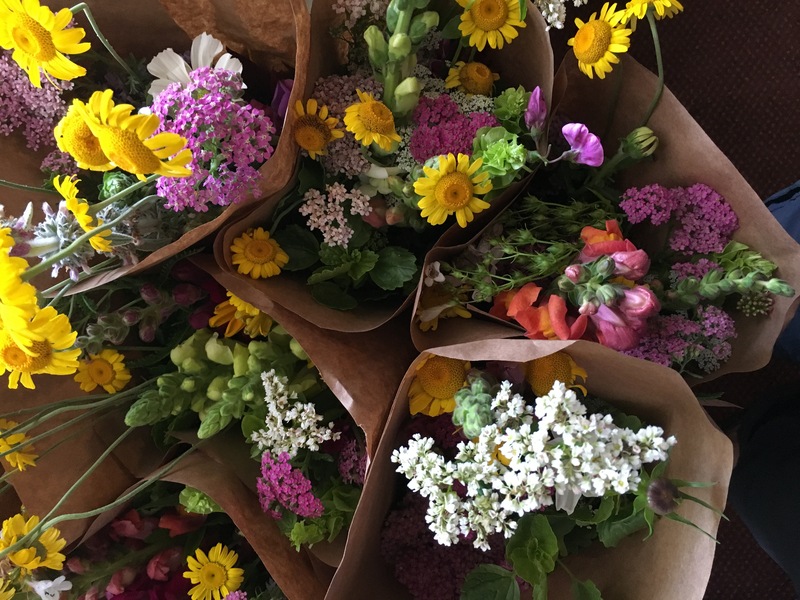 Because it is early in our CSA season, your bouquets will not be identical. All the bouquets have the following flowers, just in different arrangements. Why Buy Local Organic Flowers? Almost 80% of fresh flowers sold in the United States are not grown in North America, but in Colombia, Ecuador, Mexico, the Netherlands, and Israel. Shipping flowers from those countries to the United States incurs huge transportation, energy, refrigeration, and storage costs, leaving an enormous carbon footprint. 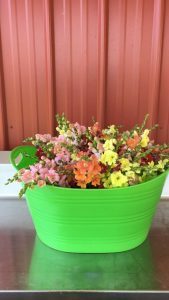 These floral materials may carry residue of chemical pesticides or fungicides. Imported flowers are often cut a week or more before they arrive in a consumer’s hands. During this time, quality and vase life decline. Locally-grown flowers can be cut in the morning and on your dining room table that evening. 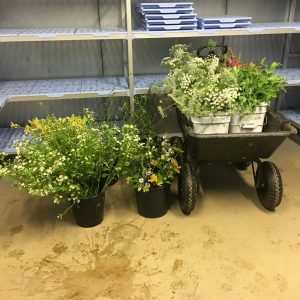 Our growers strive to produce their flowers using responsible farming methods like integrated pest management, diverse cropping systems, and low-input fertilization programs. 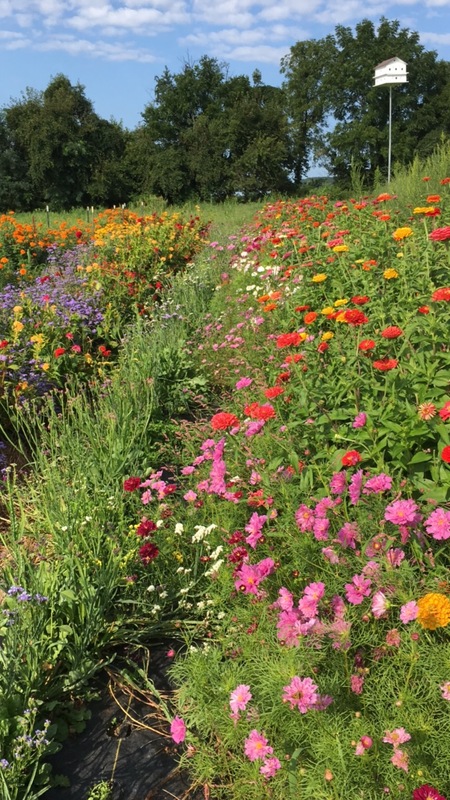 Their farms encourage important biodiversity, soil health, and water conservation. 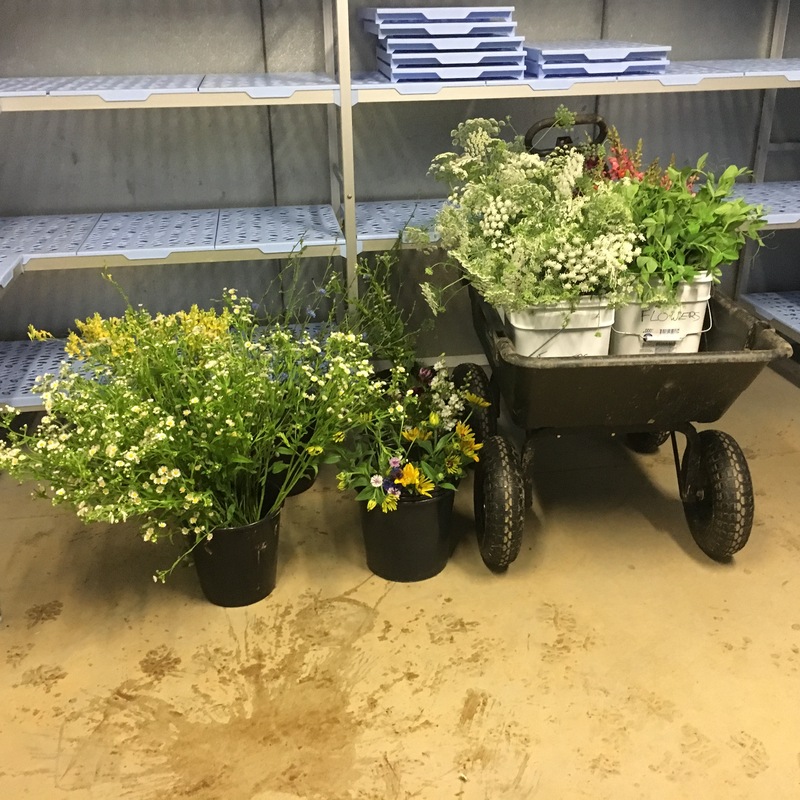 The production and sale of locally-grown cut flowers contribute to a community’s economy, and provides employment and valuable agriculture experience to young people.